Ford has released price and specification details for its face-lifted Focus. Starting from £13,995, the new model will be no more expensive than the current version. Retaining the existing model's six trim-level hierarchy, the Focus is available in: Studio (from £13,995), Style (£16,795), Zetec (£18,295), Zetec S (£20,045), Titanium (£19,795) and Titanium X (£21,795). Bucking the trend for new models, top-of-the-range Titanium and Titanium X trim levels will be available for £100 less than the current equivalents when the new model arrives in UK showrooms in November. The overhaul of the Focus represents a significant refresh for one of the UK's most popular vehicles, with revisions to the chassis and engines, as well as the usual tweaks to the interior and exterior styling. The petrol engine range grows to include a new 1.5-litre Ecoboost unit, which develops 180bhp – the same as the 1.6-litre turbocharged unit it replaces, but with a seven per cent improvement in fuel economy and CO2 emissions of 127g/km. It will join the acclaimed 1.0-litre Ecoboost engine option, which is still available with CO2 emissions of under 100g/km. A new 118bhp, 1.5-litre diesel unit is also available, which now also falls under the 100g/km CO2 vehicle tax exemption threshold. The Focus has been visually tightened up, with a new bumper, grille and headlight design, to keep it looking fresh after four years on sale. Top-spec models will feature a chrome-finished grille, while lesser examples will get a sportier looking black mesh item. Inside, material quality is up, for a more premium feel, and the once button-heavy dashboard has been cleaned up, with a more intuitive and ergonomic arrangement, brought about by feedback from existing customers. There are fewer buttons, but more technology, as the Focus is available with a raft of driver aids and convenience gadgets. Highlights include 'Perpendicular Parking', which automatically manouevres the car into tight spaces, and 'MyKey' – which allows owners to program a second key. This provides the ability to limit the car's top speed, audio volume, and a number of other parameters – ideal for those sharing their car with their children. 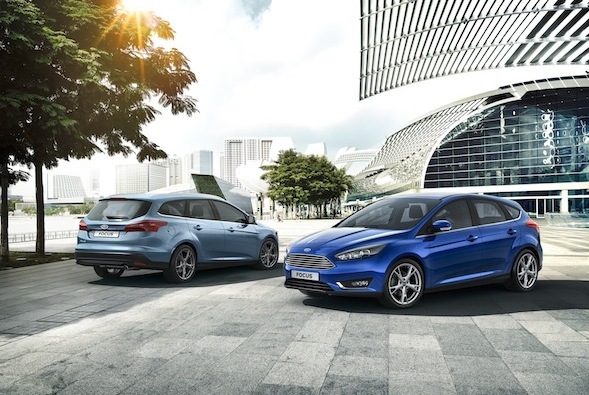 Do you like the look of the refreshed Ford Focus? Have your say in the comments section below.